The Shimansky Two Hearts solitaire diamond engagement ring collection offers the ultimate romantic design, fit for the woman who wears her heart on her sleeve. Delicately crafted in platinum, or 18K white, yellow, or rose gold, the Two Hearts collection features a beautiful solitaire diamond engagement ring. The round Brilliant cut solitaire diamond is set within a two heart-shaped setting on either side, in a sleek and distinctive design that is both eye-catching, and graceful. A profound symbol of your love and devotion, the Two Hearts ring shows two hearts coming together in unity, as they enter into the journey of life together through marriage. It symbolises the bringing together of two individuals who share an unquestionable love, and whose hearts are joined by a powerful, unbreakable force. Just like the two hearts setting is held together by the diamond, the strongest material known to man, the two hearts of a man and woman are held together by love, the strongest emotion that can be felt. Upon embarking on this journey together, the two hearts that make up the relationship, now beat as one. The powerful moment of an engagement is forever symbolised and captured in the magnificent Two Hearts ring, so that it can be re-lived, at a glance, over and over again. 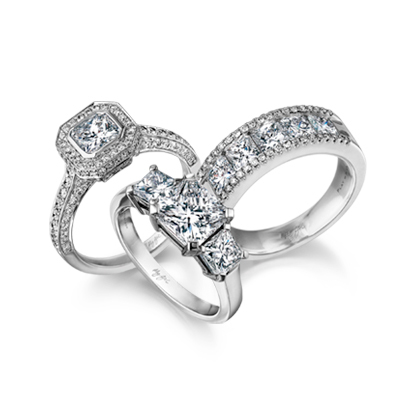 A Shimansky signature design, the Two Hearts Solitaire Diamond Engagement Ring is exclusive to Shimansky. Handcrafted in Cape Town, South Africa, at the Shimansky diamond cutting and polishing workshops, this intriguing jewellery creation isn’t available from anyone else, anywhere in the world. The simplicity of the design is what gives this ring its timeless appeal, and the heart symbols are crafted with an elegance that gives the ring its subtle, yet memorable characteristics. An exquisite symbol of a love felt now, and forever, the Two Hearts collection will truly capture your heart, and celebrate your love, allowing you to remember the special moment of your engagement for the rest of your life. CELEBRATING A LIFE SHARED WITH YOUR "ONE"
The ultimate quest in love, is to find “the one.” The one that you can’t imagine being away from; the one who makes you happier than you knew you could be. The one whose heart beats to the same rhythm as yours. When the one is found, and two hearts come together, a beautiful new life begins. All that’s left, is to seal the relationship and make your lifelong promise known with a beautiful designer diamond engagement ring. Becoming engaged is one of the most special and memorable moments in life, and finding the engagement ring that captures your love is a beautiful journey in itself. An engagement ring is not just a physical token of your commitment; it serves as a way of celebrating your special moment throughout your life, by capturing the very essence of the memory of your engagement. An exceptional symbol of romance, the two hearts setting delicately, but firmly, holds the most classic of diamond shapes – the round brilliant cut diamond. Round brilliant cut diamonds offer timeless beauty. With 57 facets, they are polished to ideal proportions and symmetry and radiate with stunning brilliance and sparkle. For over a century, diamond cutters and master craftsmen have perfected the round cut using advanced theories of light behaviour, optic dispersion and geometry. Today, the round brilliant cut diamond is considered the most traditional, classic and timeless diamond shape, and is extremely popular in engagement rings. A shape that will never date, the round brilliant cut diamond will be worn and celebrated for generations to come.